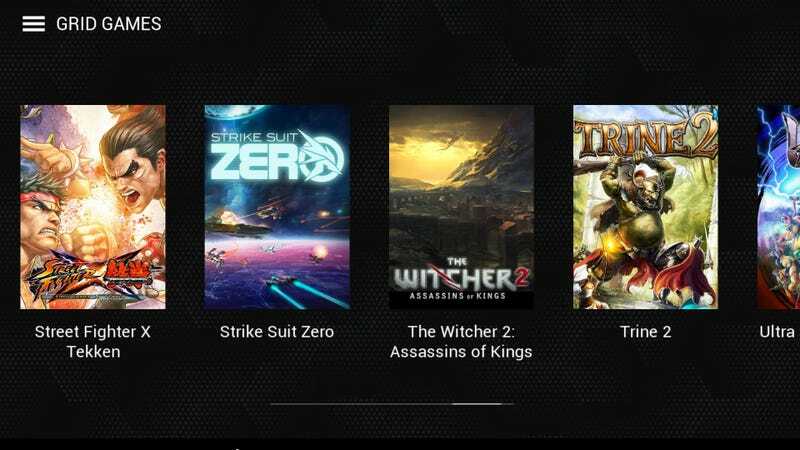 Nvidia's GRID game streaming service goes live across Shield portables and tablets today, with 20 games available for free remote play. When conditions are perfect, it's one of the best remote gaming services I've tried. Free for Shield owners through June 30, 2015, the GRID gaming service launches today alongside the Shield Tablet rollout of Android 5.0 Lollipop, making it the first non-Google device to score the latest version of the operating system. This means that one of the most powerful Android tablets available now has access to OpenGL ES 3.1 and the Android Extension Pack. Should developers harness such a combination, they could easily create console-rivaling experiences on the Shield. But we're not here to talk about life-changing Android upgrades or new native Shield games like Half-Life 2 Episode One, now being offered as part of a "Green Box" bundle with Portal and Half-Life 2. We're here to talk about PC-native titles being played over the internet. GRID launches with 20 titles, with Nvidia promising new games added to the list on a weekly basis. It's a nice and varied selection — there's an adventure, an action game, a shooter, a racer. Some are indie, some are big-name. Some are particularly daring inclusions for streaming cloud gaming, given the platform's tendency towards input lag. That's right, Ultra Street Fighter IV, I'm looking at you. Also, I'm playing you, with barely any input delay. Oh it's there, to be sure. Enough to drive a perfectly-timed professional fighting game player up the wall, but a casual player should get by just fine. In fact, every game I tried was immensely playable, but it took a massive upgrade to my wireless router to make it happen. With the older $50 plain vanilla wireless N router, the GRID's speed test failed every time. Once I upgraded to the recommended 5Ghz dual-band router (actually went tri-band with a Netgear Nighthawk X6), GRID ran without a hitch. Smoother than PlayStation Now running on a wired connection, even. I was impressed with the Shield tablet's technical prowess and utility before. Today's update majorly amplifies both.